It's beginning to feel a lot like fall which means YOU need to make the most out of the remaining days of summer. There's some cool stuff happening this weekend to cap summer off right! - Detroit Trio Live aka D3. These dudes CRUSH on the horns bringing a different twist to the mostly electronic lineup. Be sure to catch them on the FOREST STAGE at 10 pm. - Delectable. WHAT YOU'RE ORDERING: their signature kielbasa bowl with a brown rice base, kielbasa topped with grilled peppers and onions and drizzled with spicy feta sauce. Makes for a solid beginning or end of the day meal. - Mother Cyborg. THIS CHICK BRINGS IT. Diana's stage presents along with the transformative nature of her music makes her a must see. - BEER. LOTS AND LOTS OF BEER. Read our much needed survival tips for Dally Day here along with afterparty info. We look forward to seeing everyone there! If you're a creative in the city, interested in making connects or checking out new art the Detroit Design Festival is an absolute MUST for you. See, UNESCO City of Design picked Detroit as an honorary city to host some local badass artists do a pop-up exhibit. This FREE exhibit features the experiences from 70 artists who traveled to France and are coming back with all their inspo in art form. The exhibit runs through the rest of September and into October so if you can't make it tonight be sure to check it out on a different date. Three words: BELL'S. MUSIC. GIVEAWAYS. This battleship is taking off tonight starting at 5 o'clock. You won't want to miss the grand opening of Detroit's very first barcade. Off World is located above Checker Bar and a great addition to the neighborhood. The best part? Quarter games all day. The second best part? They formed a partnership with Pop Pizza. Great pizza plus epic arcade games, sounds like a legit time! The patio at Gold Cash Gold. Photo from Gold Cash Gold's website. Located in Corktown, this hip wine shop and bar offers regional wines paired with charcuterie bites, plus live jazz. You’ll also find your fair share of DJ nights and pop-up eats at this summer go-to. Featuring exceptional locally-sourced food and craft cocktails, Selden Standard combines rustic and casual style with creative and fun small plates. The patio is, without a doubt, one of the best in the city and has housed everything from weddings to corporate events. Open for lunch and dinner, Mudgie’s serves various hand-made cocktails, unique sandwiches made from in-house roasted meats, and offers catering options as well. This summer, the team took the newly expanded patio full-on Tiki and offers an array of vacation-inspired drinks from daiquiris to Mai Tais. Centered in the heart of Detroit’s Corktown neighborhood, Ottava Via serves homemade Italian dishes in a warm and inviting setting. 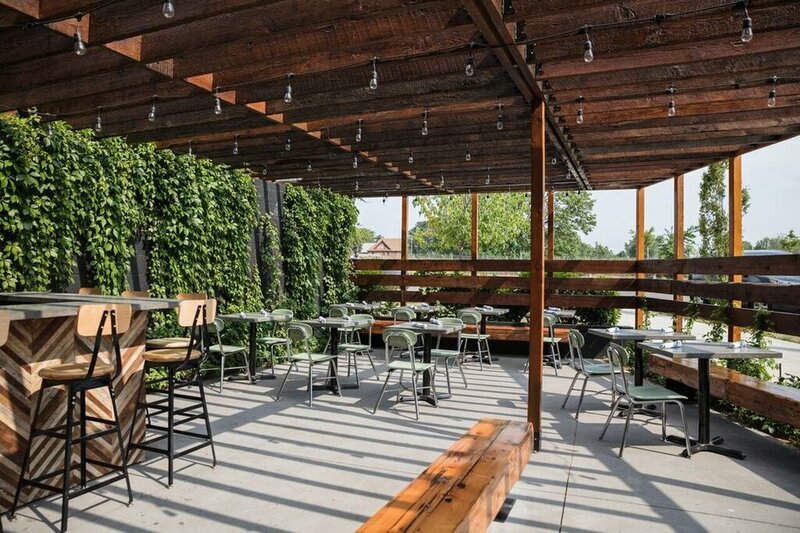 It’s got solid patio vibes with a bocce ball court to boot. Known for its long history as a live music venue, this is a popular spot for those looking to unwind and dance along to tracks late into the night. Depending on when you go, you can expect anything from rock to electronic and more. Most importantly, it has one of the best places to hang outside in the city – sometimes it’s hard to tell if you’re at a bar or in your favorite old uncle’s vibey backyard.